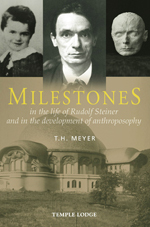 An incisive theme running through Milestones is the dual nature of time – ‘involution’ and ‘evolution’ – and how it affects the Anthroposophical Society and movement. Following Steiner’s death, a one-sided involution process has been evident in the overemphasis on the Christmas Foundation Meeting, as well as Steiner’s supposedly ‘indissoluble’ connection with the Society. This is coupled with distorted evolution processes, as seen in the urge to enter the public domain by jettisoning anthroposophy altogether. Such disharmonies can only be healed, says Meyer, by seeing the reality. This book serves as an essential guide to understanding the task of anthroposophy in the modern world. T.H. MEYER was born in Switzerland in 1950. He is the founder and publisher of Perseus Verlag, Basel, and editor of the monthly journals The Present Age and Der Europäer. He is author of many books including Ludwig Polzer-Hoditz, A Biography; D.N. Dunlop, A Biography; In the Sign of Five; Rudolf Steiner’s Core Mission; The Bodhisattva Question; Clairvoyance and Consciousness and Reality, Truth and Evil; and editor of Light for the New Millennium. He has written numerous articles and gives seminars and lectures around the world.